Hello Everyone, Welcome to the second post in my new series! As always in my Beautiful Irish Brands series this post is about more than a simple review this series is about spotlighting the Brand so first we will meet the lady responsible for bringing us dream dots. DreamDots are the brainchild of entrepreneur Donna Ledwidge who has already has huge success in the business world from owning her own salon at aged just 21 in 2004 to creating other brands Stickcons- rhinestone shoe kit and as co-developer of wow-brown tan. How do you go about creating a product like this? “I suffered with acne when I was a teenager and although I got it under control in my early twenties I would continue to get severe breakouts every few weeks. I decided my next brand would target this problem”. Quote from DreamDots creator Donna Ledwidge. DreamDots are an emergency overnight patch designed to calm, clear and heal breakouts.They are CE, BSI and FDA approved and are also Vegan and cruelty free. It is said that dreamdots can be used by everyone and as part of any skincare routine. So down to the review part. I received my pack of dream dots a few weeks ago and like many other bloggers I have spotted chatting on twitter I was actually hoping to have a breakout so that I could get the chance to test them! So after about a week of waiting I got myself a whopper of a spot, the only problem was it wanted to stay underneath my skin as one of them spots that just stays huge,angry, red and hurts like hell at all times. So I was thinking Its not a proper spot yet so It wont work but It was really sore so I said I'd go with it and hope for the best. The dream dots are like small round clear stickers, there is no fussing with them you just peel them off the backing and press them on the spot. The only thing you need to do is cleanse the area before and after and wash your hands after contact. I never felt anything having the patch on was completely unnoticed. I was delighted the next morning as the dream dot had completely taken away the sore, tight feeling that I had. It had reduced pretty much all of the inflammation and made It so this once angry whopper of a spot was completely unnoticed with a little concealer. I used the dream dots on this again the next night and by the following morning It had completely dissappeared. I am just recently married (March) and for a few months before I was constantly reading articles about your must haves for Bridal emergencies. Dream Dots should be on top of all of these lists! It is honestly the most useful thing that Brides, Grooms or anyone could have in an emergency Kit a serious problem solver that actually works. Well done to Donna and her Dream Dots team on such a fantastic and innovative product. Dream Dots retail for €14.95 for a box of 24 dots. Or from pharmacies across Ireland. 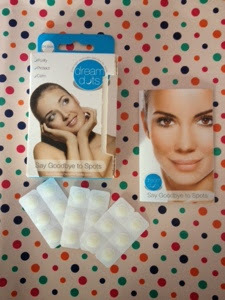 Have you tried dream dots? Please leave a comment I read and reply to all. I recieved the dream dots as a pr sample this has in no way influenced my review.